The Massey Treadle Swing™ is not a new technology. In fact, it is based on a Treadle Swing design that dates back to around 1910. Swings n' Such has taken this basic treadle design and added features and enhancements to make it ideal the home, at the lake, around the pool, on the patio, or in your yard. The chair is supported by two solid supports. This offers stability and strength. The "treadle" is a foot rest supported by two chains. With just a gentle pust of the feet, the swing moves in a smooth gliding motion, letting you enjoy a smooth realxing swing. Swings n' Such has designed a custom Arbor to support the swing. The Arbor is supported by two five foot rails for stability. This design allows the Massey Treadle Swing to be easily relocated. The Massey Treadle Swing™ seat is contoured for comfort. A standard Massey Treadle Swing™ comfortably seats two to three individuals. It doesn't take much to move the Massey Treadle Swing. In fact, the treadle design makes it seem like the swing is doing the work. However, this small level of effort is just right for helping relax tired or aching legs. The Massey Treadle Swing has been used to enhance the beauty of many facilities and yards. The Arbor swing comes in a beautiful redwood water proof stain. The Arbor is designed with attractive accents. The Arbor adds supports for growing vines that can offer beauty and shade. All weather materials are used in the manufacturing of the Classic Massey Treadle Swing. This includes treated lumber, galvanized chains, and fasteners. Learn how to get your own Massey Treadle Swing and Arbor. How Can You Reserve Your Own? The Massey Treadle Swing Arbor provides a stable platform for comfortable swinging. Contoured seats, cup holders, narrow seat slats, and gentle action allow for extended stays in the Massey Treadle Swing. 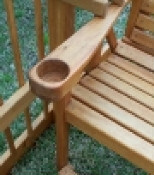 Cup holders are built into the arms, creating a natural gathering place for relaxing and visiting with friends.